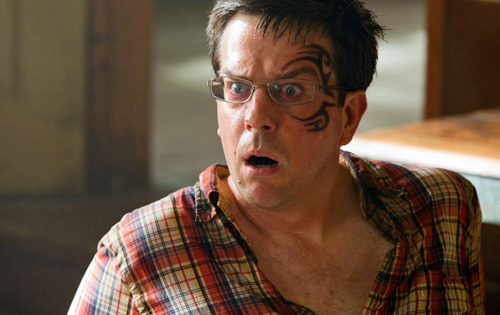 Hangover Copyright Infringement of Tyson Tattoo? The Hangover: Part II, set to hit theaters this Thursday, will not be hampered by a copyright infringement lawsuit, at least for now. The tattoo on Mike Tyson’s face was done by tattoo artist S. Victor Whitmill, and Whitmill’s work is distinct enough that he doesn’t want anyone copying it. That includes Ed Helms’ character, in the second installment of the Hangover saga. The problem is that Helms’ tattoo wasn’t done by Whitmill, and he claims Warner Bros. took unlawful liberty in reproducing his distinct style on someone else’s face. Someone else’s high-profile face, that is. The tattoo factors highly in the marketing campaign for the film. Whitman sued Warner Bros. for copyright infringement (Case No. 4:11-cv-00752-CDP, Missouri Eastern District Court), and wanted an injunction to stop the release of the movie. Fortunately for fans, a judge denied the injunction today in federal court. However, the suit was not thrown out, and it will be interesting to see how it plays out.